“At SLN Technologies, we strive to grow and excel with innovation in sync with the ‘Make in India’ vision. We have been serving the Aerospace & Defence industry for the last 21 years and supporting Defence public sector units like HAL, BEL, ECIL, DRDO and BDL in various prestigious projects’ said Anil Kumar Muniswamy, Managing Director, SLN Technologies. “Our culture of quality, integrity, teamwork and value for people inspires each of us to bring our best to work. It helps us leave a lasting impression with our work as well. The India Today Make in India Emerging Entrepreneur Awards were instituted in 2016 to recognize Indian businesses, entrepreneurs in the Small & Medium Enterprise (SME) segment for their outstanding achievements, sustainable growth / contributions in select categories, employment generation capacity and for promoting economic and social initiatives. It is now one of most sought after Awards in India. 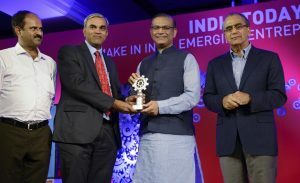 This year the 2nd edition of the award ceremony was organized along with India Today Make in India Emerging Entrepreneur Summit on 6 July,2017 at Hotel Taj Palace, New Delhi. The distinguished jury comprising of eminent luminaries such as – India Today’s Editor-in-Chief Aroon Purie, Sanjay Nayar, Member & CEO of KKR India ; Kiran Mazumdar Shaw, Chairman and Managing Director of Biocon; Baba Kalyani, Chairman of Kalyani Group; Manish Sabharwal, CEO, TeamLease and Uday Kotak, Chairman , Kotak Mahindra – nominated the winners for the 2017 Awards after intense deliberations. 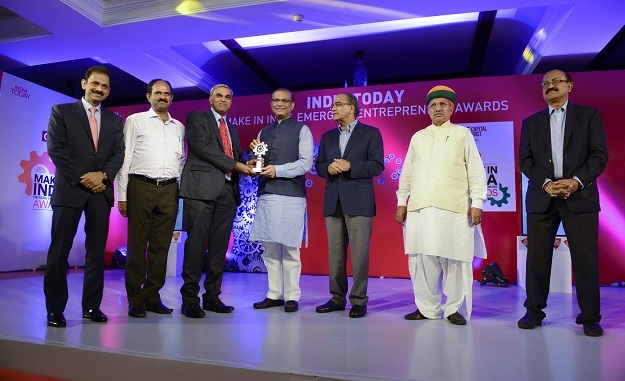 The Award function was graced by the presence of Shri Jayant Sinha, Minister of State for Civil Aviation, Government of India as the chief guest and Shri Arjun Ram Meghwal, Union Minister of State in Finance and Corporate Affairs, Government of India as the Guest of Honour.